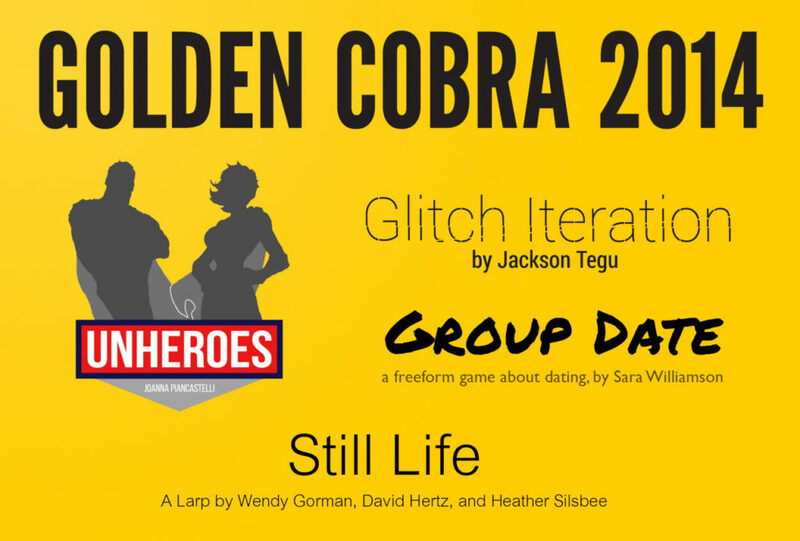 Three organizers from the Larp House bring home a Golden Cobra award for their groundbreaking freeform. Congratulations! A refreshing and thoughtful metaphorical freeform larp that keeps us moving forward in thinking about the potentials for role play. Throwing out assumptions left and right, like the need for plot, action by the players, people as characters, and focuses on stillness, interior play, subtle changes in position and being with the people and issues around us. Still Life gives us the opportunity to larp as the inanimate, to live and breathe passivity for 2 hours without being bothered to make a power play or do something beyond simply communicating (and building from there). We as judges insist that this game be played. Still Life grabbed each of the judges immediately and wouldn’t let go. We kept returning to Still Life and marveling at it. While many contest entries tread familiar ground, the designers of Still Life took the weird path into rocky country (sorry). This weirdness pays off immensely in a game that is at once bonkers and full of strange pathos. Wendy Gorman, David Hertz, and Heather Silsbee’s game is instantly inspiring. It’s so cunning in its vision that each judge wanted to play it almost at once. Many of the structures of play that are usually taken for granted are effortlessly tossed out the window by this game, and players are left with a broody and subtle experience. Who knew it was possible to yearn so hard for the experience of pretending to be rock! We would have said it couldn’t be done, but with Still Life we have been proven wrong.